ARIS imagery of eels moving in front of the trashrack. Data provided by Hydro Tasmania. Building on earlier work we had done with DIDSON data (Classifying Sonar Images: Can a Computer-Driven Process Identify Eels? North American Journal of Fisheries Management 28:1876–1886. ), we developed a semi-automated method for counting adult eels in imagery collected with an ARIS 1800 acoustic imaging system at the intake of Trevallyn Hydro Electric Power Station (Tasmania). The imagery was collected in 96 beam mode, over a 12 m range window with 14 m maximum range, at very high down-range resolution (6 mm), with 7 frames per second. The high quality of the imagery (image clarity, high signal to noise) made this dataset an ideal candidate for automation. Our approach was to develop an analysis method in four phases, starting with a thorough visual examination and manual marking of eels, followed by an assessment of the effect of sub-sampling 20 minutes of the hour and a comparison of manual results with those obtained with automated image processing. Based on these results we settled on a method that combines a quick visual preview of sub-sampled background subtracted imagery generated with ARIS Fish software with a fully automated process in Echoview, which does not require any supervision. We found this hybrid method provides high accuracy with a minimum amount of user interaction. Example of an echogram of clean ARIS data that can be auto-processed. 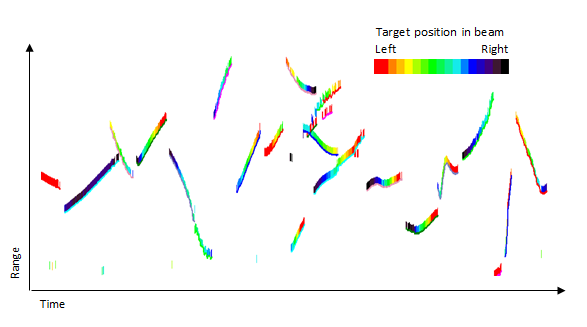 Automatically detected eel tracks (thin randomly colored lines) overlaid on a single target echogram colored by target position in the beam. Time series of 20-minute counts of eel sightings obtained manually compared to counts obtained with the automated Echoview process.